Experts agree that you need a lot of money to retire. Life expectancy continues to increase, which means you must have a larger nest egg before leaving the workforce. Inflation and taxes will both probably increase with time. And perhaps most surprising to a lot of retirees, the cost of healthcare is now rising faster than everything else. To make things worse, Medicare doesn’t cover the entire cost of health insurance. That’s why many companies sell plans to cover the so-called “Medigap.” The size of the Medigap depends on where you live. We found the data for our map at Health View Services, a financial advising company focused on helping people develop investment strategies to meet healthcare costs. We simply plugged HVS’ numbers onto a heat map where the color corresponds to the size of the gap in coverage between obtaining full health insurance and what Medicare covers. This lets you easily see where the biggest problems are, and it highlights the states where retirees might consider relocating. Our map contains both good and bad news for retirees. 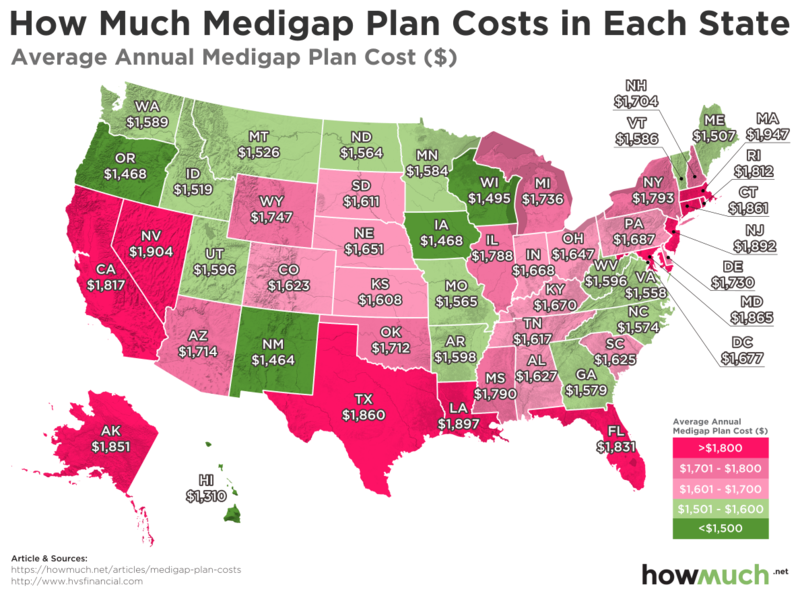 The bad news is that many states require Medigap plans costing more than $150/month. In fact, the most expensive state is Massachusetts, where it will cost $162.25 each month. That’s a decent chunk of change. Even worse news is that the state most closely associated with retirement—Florida—isn’t much better off. The Sunshine State requires an extra $152.58 each month. That’s a lot for people on a fixed income. The good news is that there are several states with much smaller Medigap amounts, many of which are located in favorable climates. Take a look at New Mexico ($122.00/month), Georgia ($131.58/month) and North Carolina ($131.16/month). And let’s not forget the cheapest state in the Union for Medigap coverage: Hawaii, where it costs only $109.16 on average. That’s another great reason to move to the Aloha State. At first glance, Medigap costs don’t seem like much, certainly not enough to justify moving to a whole new location. But what if you are just starting to think about retirement, and you already plan on moving to another state, somewhere warmer? Saving about $20 to $30 each month can really add up, especially if you rely on Social Security as the only source of income. That might just be enough to tip the scales in favor of one retirement destination over another.